For the last two years, Blair has been receiving a lot of international visitors. These include a Nigerian king and teachers from Egypt and Brazil. Last year, Blair had an honor to receive a king from Nigeria. 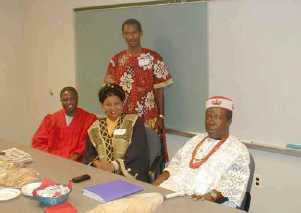 He came to the U.S. to receive an honor at Howard Univeristy for his support of education in Nigeria. He wanted to visit a U.S. high school but the only high school he was interested in was Blair because he heard that Blair had the best representation for what he was looking for. When he was here he meet with the principal, Mr. Gainous, same teachers, and same students. "He was very impressed with the school," Mr. Gainous said. He wanted to establish a partnership between Blair and a school in Nigeria. The system of education in Nigeria is different from the one we have in Blair. For one thing, they don't have the technology that we have in Blair. The king said he wanted to improve the technology in his country. Mr. Gainous was honored to have a king in his school. "This experience was unique and educational," he said. The king was not the only one interested in Blair. There have also been groups of teachers from other countries coming to learn about our system of education in Blair. We had same teachers from Egypt and Brazil. The teachers from Brazil were science and math teachers who teach high school and college. They were chosen by Brazil's Department of Education to visit schools in the U.S. They come here to observe how teachers teach science and math in Blair. Speaking through their translator, Mr. Arthur Soares, one of the teachers said, "The system of education is based on technology, but the one in Brazil isn't based on technology." They said that in Brazil there is a lot of emphasis on theory, but here there is a lot of emphasis on doing things to try to understand the theory. The Egyptians were English teachers. They came to Blair to observe the way the teachers planned and managed their classes. The Department of Education in Egypt chose them to come to the U.S. to learn new methods of teaching. They are taking courses and the University of Maryland Baltimore County and are going to visit different schools in Maryland.